Plan vacation or business trip with eTravel.com and take advantage of cheap rates on flights booking, airline tickets, and lowest airfares for Bangkok. 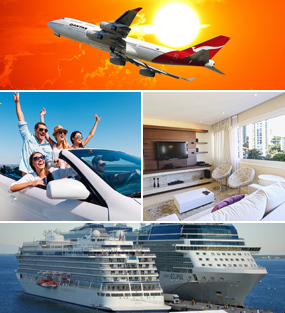 Search cheap flights to Bangkok, find and book single or multi-city destination flights. On this page we give you information and glimpse of visiting places in Bangkok, Bangkok, Thailand. The Capital of Thailand, Bangkok, is the ultimate destination for a complete sensory overload with an Asian twist. The food represents sophistication with hints of tradition and splashes of Thai culture. Bangkok city is covered in shiny structures that contain mega malls, restaurants, entertainment and the nation’s top businesses. During your urban expedition, the Bangkok nightlife has to be on your list because the parties here are totally out of the world. You want to vacation in Bangkok when the humidity and heat are low. That is from late October to March. However, you will have to deal with the other tourist and do some well-planned research to find good rates on everything. The heat and humidity begin to rise in April and continues to do so till mid-October. But the frequent rainfall helps cool things down and also reduces the prices. What are the Top Attractions for Tourists in Bangkok? Bangkok has everything you imagined. The color, noise, crowds, excitement, culture, delicious cuisine and a sense of serenity amidst all the activity. The high energy will smack you in the face and leave you feeling tingly with wonderful delight. There are tons of city gems to uncover and wonderful marvels to experience when in Bangkok city. Chatuchak Market –If you love local markets, the Chatuchak Market is where you need to head to. The 15,000 stalls will lure you in with their dreamy colors, delicious smells and wonderful magic. You will need the entire day to enjoy all the delights of the market and get a sizable bite out of the traditional Thai food, artifacts and everything in between. Grand Palace –If you have to pick just one historical destination in Bangkok, it has got to be the Grand Palace. This grand decadent residence has been the home of royalty for multiple generations. The spectacular structure is intricately designed and an absolute wonder to behold. Lumpini Park – When the sounds of the city get too loud, Lumpini Park will be your green oasis from all the noise. So after a day out exploring the city relax in the shade for an hour or two. Khao San Road – It is every bag packer’s dream spot. It has some of the best food you can sample, low priced guest houses and amazing little trinkets that serve as souvenirs too. How to Save When on a Bangkok Tour? Bangkok has an amazing public transportation system that covers almost the entire city. So make the best of it to travel for cheap. Make sure you purchase your flight tickets in advance, so you can enjoy low priced airfare. Do the same with your accommodation as well. When it comes to eating and drinking go to the best local spots. Also, travel with a group of people. It should help you get good discounts on almost everything.